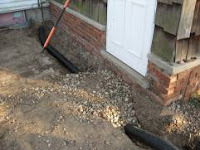 Drainage is the other motivation for these projects. No one likes a leaky basement, and for sure no one likes mildewed holiday decorations. (If you do, I've got a nice selection that need to move along.) 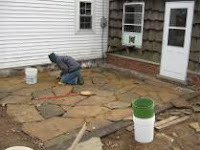 And friends took up their flagstone patio to put in pavers. We spotted the stack of flagstones, and craftily rubbed our hands together. It was great fun trying to piece together a pattern that worked for the space. 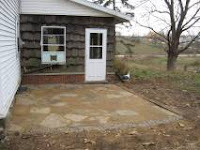 We also used one of the larger stones as a doormat/step just in front of the door. Richard became proficient in shaping the stone with a chisel, and we continued to spend a great deal of time using the level to ensure we maintained the pitch. Some settling has occurred, and we've got two five-gallon buckets of sand on hand to continue filling in as needed. We do need to keep it clear of snow or we end up with a thick pad of ice. 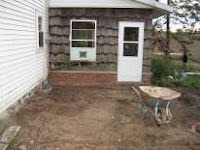 Woodash works well for traction if it gets slippery, but as long as we shovel or sweep all seems well. And it's just beautiful to boot. Hey - you guys have been busy! I didn't know you had such a purty patio - I'll tiptoe lightly across when next I come over.